Two friends in High School….. Hanging out, talking about girls, clothes, parties and cars, each one NEVER revealing to each other that they both shared a passion, talent, and pure GIFT for Hip Hop, and writing rhymes… "We were just good friends, "boyz" going to school" laughs Darrell Johnson, known as "DNA" of the duo. "Just two 10th grade students, busy chasing girls, or simply "buggin out" in class. Somehow, we never really discussed each others ambitions like that". Christopher "Snowillz" McEachern agrees. "I didn't think it was that important, cos we were actually aspiring singers at first. We each had NO IDEA that each other wrote rhymes, spit, or was even into Hip Hop like that". It wasn't until the boys were in study hall at Brooklyn's Paul Robeson High School that they discovered they shared the same passion for writing rhymes and performing. "On breaks in study hall, the students would form ciphers (groups of rappers) and "go in" says Snowillz. "I kinda looked at him, and he sorta looked at me, and we both started saying, I didn't know you did THIS! !....oh SNAPS!!" "It just started from there" grins DNA. "The group first started out with 4 members, and we called ourselves the "Final Four", but one of our members moved to Atlanta, so the name for obvious reasons, had to be changed". After a while, the lyrical and musical chemistry between Christopher and Darrell was so strong and obvious, the third member simply dropped out. Thus the name, eMeiNesS (an acronym for Music's New Savages) was born. 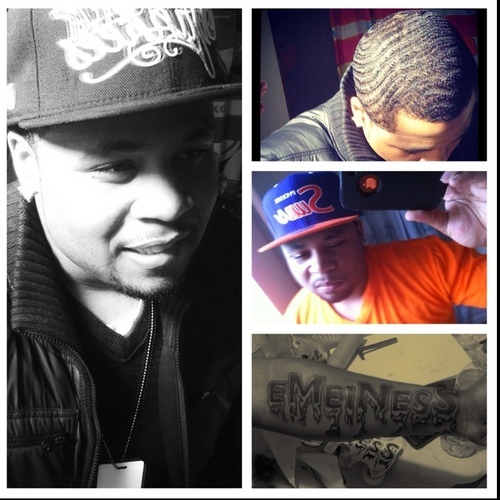 eMeiNesS captures the spirit, enthusiasm, and true brotherhood of rap duos of the past. Groups like Outkast, PM Dawn, EPMD, Method Man & Redman, and others. "More than just the music, they shared a common bond of brotherhood, trust, and a certain musical integrity. Not just 2 dudes spitting their verses, but guys that work together, inspire, encourage, and help each other to achieve a sense of musical perfection. We hope to make our audiences feel that vibe that LOVE, through all of our musical endeavors. Plus we were both Theater Arts majors, so we LOVE to perform." With their first two single releases, "Stank N' Here", and "Wish I Neva" featuring Shalette B, the "First Lady" of Thatfemale Productions, eMeiNesS plans to bring the freshness, energy, and "head-nodding" attention that two talented High School buddies can bring!! Armed with Hot Verses, Crazy Rhymes, and Blazing Production, eMeiNesS will inspire and revitalize the newest generation of Hip Hop listeners, for years to come! !